(PhysOrg.com) -- The African Giant Pouched Rats, Cricetomys gambianus have been trained to methodically sniff out land mines in war-torn regions of Africa. Apopo International based in Antwerp, Belgium is a non-profit organization that trains and puts into action the raccoon size bomb sniffers. 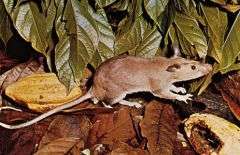 The Giant Pouched Rat is not a member of the rat subfamily Murinae, but is in fact a uniquely African radiation of muroid rodents. The Giant Pouched Rat can weigh up to 9-pounds and in appearance resembles a hamster. Noted for large pouches located in their cheeks, the nocturnal Giant Pouched Rats are found in the wilds of Africa feasting on berries, nuts, insects and prefer palm fruit. A land mine clearing project in Mozambique using Apopo trained Pouched Rats has been operational for two-years and to date cleared 270 square miles of land in Southern Mozambique. Families dislocated from their land since the 1980s have been allowed to return to their villages and farms. According to a spokesman trainer from Apopo the training is currently being done at Tanzania´s Sokoine University School of Agriculture. The training takes approximately 8 to 10 months at a cost of $3,000 to $5,000 per Pouched Rat. Canines have been trained to do the same work, however the cost for training can run up to $40,000. The additional advantage of using the Pouched Rats is their overall remarkable resistance to certain tropical disease and their weight does not trip land mines. Tests to standardize the trained Pouched Rats were conducted by Sokoine University under the supervision of the Geneva International Centre for Humanitarian De-Mining. The trained rats are now officially licensed by the National De-Mining Institute of Mozambique. Numerous other African nations are joining in the effort to utilize the trained rats to clear land mine fields. Land mines are present on other continents as well. The Giant Pouched Rats are indigenous to the lower parts of the Ulugura Mountains and known by natives as ´epanya bukui´. A distinct feature of the breed is its relatively long life-span that extends up to eight-years. Thus, the training, care and cost factors are greatly reduced as compared to rat sub-family breeds which is generally two to three years. The Apopo trained Pouched Rats work in early morning shifts before the Sun´s heat becomes unbearable. The Pouched Rats are able to sniff out plastic and metal mines. A Pouched Rat scratches the surface of a mine sight to signal to their handlers that a mine has been found. The handler then bestows a favorite treat to the mine sniffing victor. The keen sense of smell possessed by the Giant Pouched Rats is being tapped to detect disease in sputum samples. Currently, trained Pouched Rats have detected more than 300 cases of tuberculosis in sputum samples that had not been diagnosed by the medical staff. Their extraordinary olfactory capabilities is currently under study for extending their usefulness to a myriad of circumstances. Described as the "Hero Rat" by trainers and scientists, the Giant Pouched Rat does have some critics. Apparently, some private individuals have chosen to obtain the Pouched Rat as an exotic pet and then abandoned the pet in the wilds of the Florida Keys. The Pouched Rat is listed as an invasive species in Florida with a concern the rodent will impact the ecological balance of the Everglades. In 2003, the U.S. Centers for Disease Control and Prevention issued a ban on importing the Pouched Rat due to concerns of outbreaks of monkey-pox. The African breed is believed to be a carrier of monkey-pox. Nevertheless, the keen sniffing, generally affable Giant Pouched Rat remains a hero to nations faced with the onerous tasks of ridding villages and farm land of mines. The Apopo trained Giant Pouched Rat is rigorously monitored by scientists and obviously cared for to the umph degree and poses no health concerns. However "old" this story is, it is still in practice and therefore current. It's a marvelous story. It's got science, innovation, humanitarianism, and 9 lb rats. What more could you ask?